Pain: If something is painful, muscles tighten to take pressure off the painful structure. This is a protective mechanism. Scar tissue: Scar tissue acts like glue in a muscle. The section of the muscle containing scar tissue will not stretch as much as it should, limiting muscle length. Nerve entrapment: If scar tissue forms next to a nerve, the nerve can become ‘glued’ to the surrounding muscles. Nerves don’t stretch; they should floss in and around muscles. When they stick to muscles, the surrounding muscles will contract to protect the nerve from being stretched. Fatigue: When muscles become fatigued, they tighten. Trigger points: Bands or nodules of irritated muscle fibers that can cause the surrounding muscles to tighten as well. In each of these cases, stretching would not be an appropriate form of treatment. If stretching were used, improvement would either be delayed or prevented. Stretching is beneficial in other circumstances. For example, after a nerve entrapment has been released, stretching is used to glide the nerve through the muscles, preventing scar tissue from forming again. Yes, muscles are necessary for the body to move. But just as important is their role in stabilization – protecting and supporting the skeletal structure. Muscles must be strong and balanced. If this isn’t the case, joints suffer. Joint damage includes cartilage tears, degeneration, arthritis, and disc herniations. Muscles rely on the brain to tell them exactly when to contract, how hard to contract, and when to relax. Trouble occurs when communication lapses. The brain creates programs for certain motions. For example, a program is created and continually improved as one practices pitching a baseball. The more a pitch is practiced, the more efficient the program becomes. As long as everything is working properly, all is well. Problems occur when these programs are somehow disrupted. Pain, poor posture, weak muscles, improper training, ill-fitting equipment can all cause the brain to reprogram these pathways into a less efficient system. Muscles will no longer contract when and how they should. For example, if you step of a curb unexpectedly, your brain must tell your muscles to contract immediately to protect your spine and catch your step. The small stability muscles that control the position of your spinal joints need to contract first. They put the joints in a stable position. The muscles that contract next are the large muscles that keep you from falling. If your spinal stability muscles have a faulty program, your joints won’t be in a stable position. When the large muscles contract, they will load the joints in a bad position. Over time this improper loading, not just from the unexpected step but also from the sudden reach to catch a falling toddler or the misstep on the uneven sidewalk, leads to problems such as degeneration, arthritis, disc herniations, and soft tissue damage. Specific stabilization exercises correct faulty motor programs. The brain must be retrained, so the exercises could be considered more of a “learning” exercise than a purely “strengthening” exercise. If the faulty programs aren’t corrected, a chronic problem is likely. Strength exercises are often a necessary step to fix a problem permanently. Because muscle weakness so often is a catalyst to injury, the weakness must be corrected or the injury will return. Muscles become weak for many reasons. It’s critical to determine why specific muscles are weak before jumping right into strengthening them. When applied to the treatment process too early, strength exercises can be ineffective, inappropriate, and counter productive. 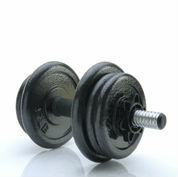 After other problems have been identified and corrected, specific exercises can be implemented into the treatment plan. To be effective, strengthening occurs sequentially. First the weakest link in the chain must be isolated and strengthened independently. If this step is missed, surrounding muscles, which have been compensating up until this point will continue to do so. After the weakest link is strong and balanced, functional exercises will be used to improve overall strength. It is important that each muscle in the body is capable of doing what it is intended to do.